Watching a recorded episode of Fishing Australia yesterday, Rob did a quick little segment on fishing at Bawley Point / kiola. The stones in the background looked promising, so i thought I might make a the 20 minute run down there today. Grabbed my blackie rod, a little snap lock box of gear and a loaf of bread and headed down to the water. Looking at the waves as they stood up 30m from shore i could see a school of Salmon on the move..
Stuff this, I made a quick dash back to the car to grab my 10ft drummer stick and some metal slugs..
After a couple minutes and half a dozen jumps up comes a sambo onto the rocks. 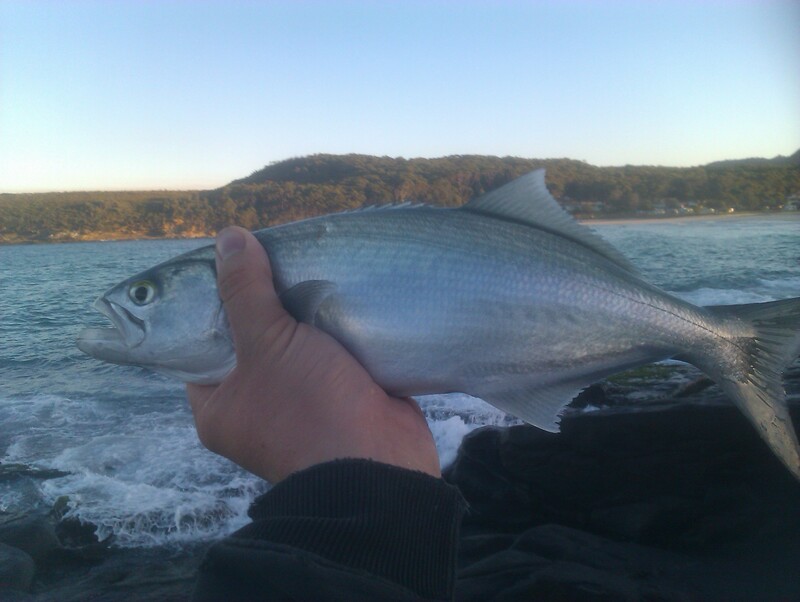 Not a bad sambo, went 64cm. Next cast saw 2 good hits before a hook up. 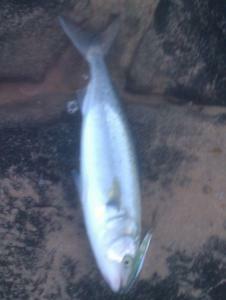 Got him 10M from the sure before he jumped out of the water and spat the lure. 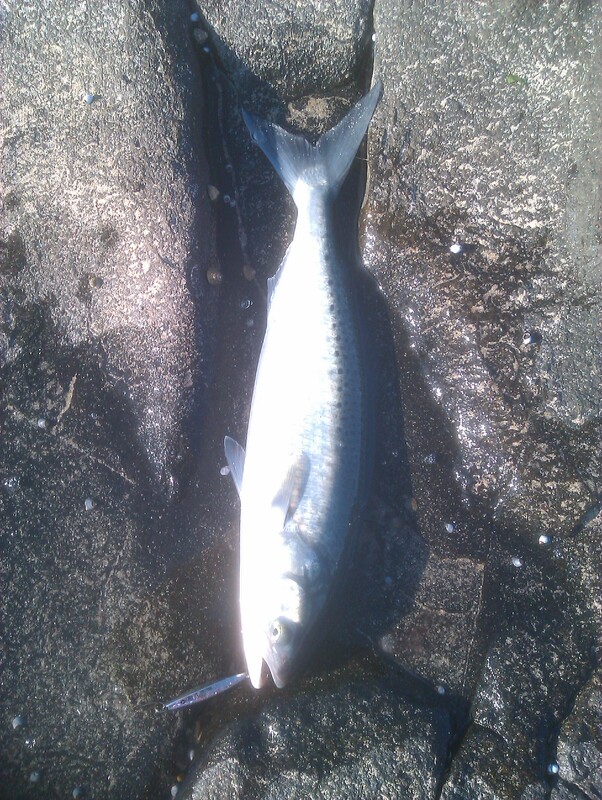 Started to reel the lure back it for another cast when I got smashed about half a meter from the sure. Up came a little Tailor around the 35cm mark.. 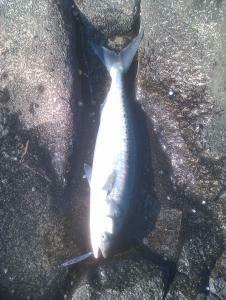 The next half hour was 9 casts for 9 Salmon.. all around the mid 50cm mark..
All of a sudden the school moved on. made about 20 casts for no result. By this stage my back is starting to feel the strain of juggling a heavy 10ft carbon stick.. Bit clean through the 12lb Fluro leader. A quick look through my bag confirmed that 12lb was the heaviest leader I had in there. Re rigged and straped on another trusty slug. cast into a similar spot but a few more meters of the shore and skipped the slug across the water again, a couple of quick winds and the tailor are smashing up the water after my lure again and smashed it. Same thing happened again, bit through the leader. Looked to be a pretty decent chopper. I hatched a plan to double over the last 200mm of my leader. Looked like crap, but I figured the chances of keeping my lure had to be improved. Dragged in tailor after tailor. Most where around the mid to late 30cm range. Noticed the Salmon school coming back around the rocks again. Waited till they came into range and tossed the metal at them. For the next hour it was a fish for every 3 casts. I had no real plans to take any tailor or sambos home. 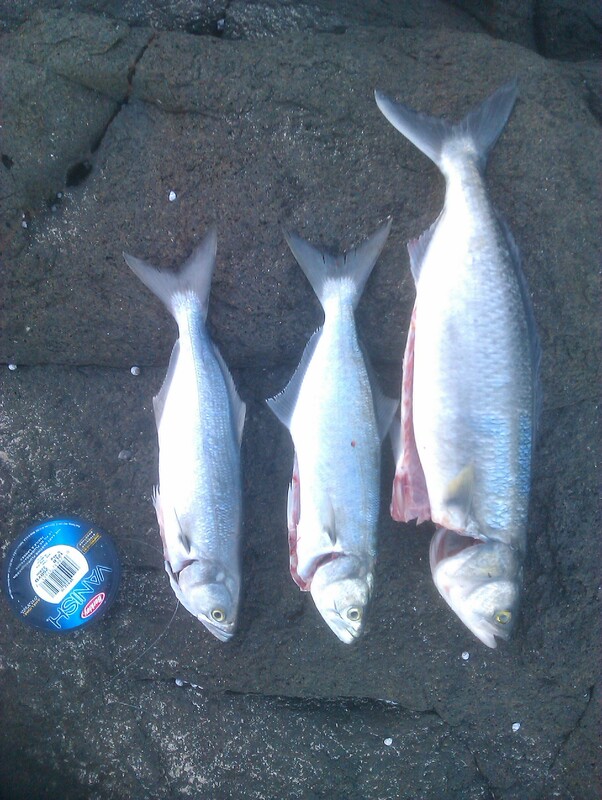 Deep hooked a couple of tailor and a sambo. had to keep them as they where in pretty bad shape. So I ripped the treble hook of to replace it with a suitably sized single hook. Put in 10 casts. The fish would follow the lure but would not hit it.. The single hook that I had fitted was red in Color. changed it out for a black hook and the fish where lining up to jump on the lure again. Looking around there was not another person in sight... i could not believe I had this bite all to my self..
About 4;30 the bite started to die off in a big way..
grabbed the phone out for a couple of quick snaps.. Made a quick call to find a home for the 3 fish I had to keep. Every thing else was released to fight another day..
Sooooo jealous. Sounds like you had a ball. great report and a fun session..